The existence of short life ranges of larger benthic foraminifera in Cretaceous carbonate sequences make possible significant and broad stratigraphic correlations. There were three major groups of the Cretaceous: 1) the agglutinated forams, which survived the crossover from the Jurassic, 2) the porcelaneous milioline forms (which replaced the aforementioned agglutinated forams before the Cenomanian) and 3) the hyaline calcareous rotaliines and orbitoids, which replaced the miliolines at the end of the Cenomanian. Readers are referred to Chapter 5 of BouDagher-Fadel (2008) for a thorough biostratigraphic and evolutionary description of the Cretaceous textulariine, milioline, and rotaliine superfamilies. It was mainly the agglutinated larger forams that survived the minor Jurassic-Cretaceous boundary crisis along with a few deeper water forms with narrow alveoles. These forms thrived through the rapidly warming atmosphere and oceans that marked the Early Cretaceous period. The Tethyan realm was the main breeding ground for larger forams and rudist reefs, which were dominant over the scleractininan corals of the Jurassic period (Johnson et al., 1996). 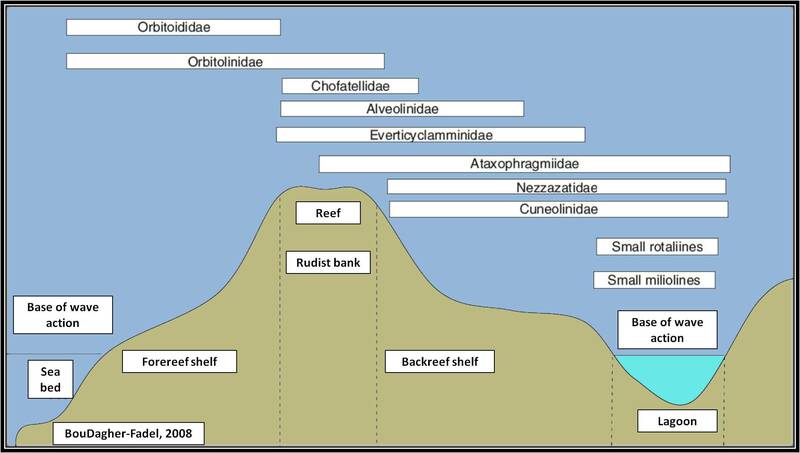 The tropical climate throughout the Tethys region (see figure left) led to increased oxygen levels and superheated oceans, which helped to facilitate larger tests and complex wall structures of benthic foraminifera. A significant new lineage appeared in the Tethys during the Barremian. These were the robust agglutinated orbiolinids which were typically found in outer platform environments (Vilas et al., 1995) and were believed to have a free, epifaunal mode of life living on the substrate (Masse, 1976). These forms are important because the relationship between orbiolinid shape and paleobathymetry is similar to that noted in Holocene large benthic foraminifera (Reiss and Hottinger, 1984). From the Aptian through Albian, rudist diversity beat out coral diversity, perhaps due to high water temperatures, however, by the end of the Mesozoic, they were extinct. The alveolinids with large alveoles became prominent within the Cenomanian. They inhabited the inner shelf and were restricted to littoral, tropical and protected shelf environments. Below is a figure of the genera of large benthic forams that existed during the Cretaceous. Benthic foraminifera became cosmopolitan and colonized deeper waters in the Late Cretaceous and the configuration of the continents at this time allowed warm waters from the Equator to circulate freely. Niches that were freed up towards the end of the cemonian were filled by new, highly evolved rotaliines wtih orbitoidal tests, which gave these forms an advantage over the smaller ones. Larger protochonchs of the orbitoids helps to speed up test growth and may be related to high light intensity of the photic zone (Drooger and Raju, 1973). Various forms required different ecological settings but for most genera, a water depth of 50 m is the limit of habitation with the exception being the Caribbean (BouDagher-Fadel, 2008). 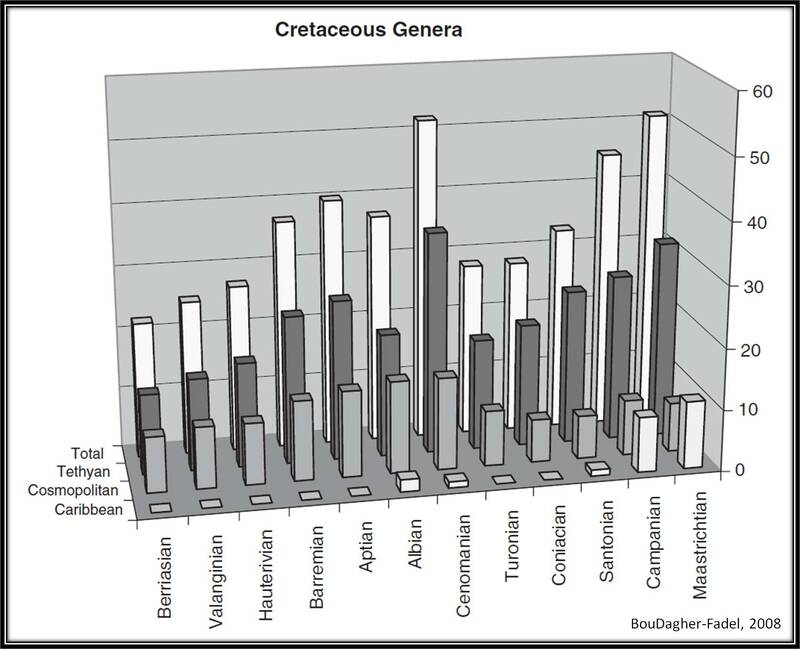 Overall, benthic forams of the cretaceous occupied various environments including near wave base, lagoons or in sediment overlying or underlying reefs (see figure below).